Laos is probably one of the best countries in S E Asia for dirt riding. Tourists, plus scores of guys – Thai & expat – from Thailand & Malaysia go there to ride the dirt trails & wild jungle tracks. 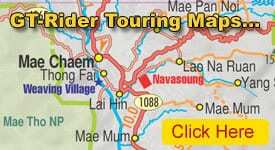 GT Rider has compiled a list of dirt rides ‘n reports for the North, the North-East (Plain of Jars) & the South of Laos. You can use this GTR Lao Dirt directory for quick access to the best areas where you may want to ride.